Because every engineer loves a good Nixie tube thermometer. If you want to know the temperature, normal digital thermometers, or increasingly the Internet, are usually good enough. Visually though, it’s hard to beat the warm glow and retro look of a Nixie tube. What better way to display this than with a three-digit tube display like Luca Dentella’s build. His process is outlined in a series of 10 posts that can be found here, or you can just skip to the completed version. The “brain” of this display is a Arduino Pro Micro (ATmega32U4). It uses a thermistor-style temperature sensor, which has a resistance than changes depending on the temperature, to tell how hot it is. The display is, of course, three nixie tubes. The first thing that’s interesting about the setup is that the third tube shows “°C.” Dentella is using an “IN-19A” tube for this purpose, which can also reveal a number of other symbols. In this case, it shows the degrees Celsius value at all times. The other interesting part of this design, besides the generally clean layout and printed circuit board use, is that each tube has a programmable LED under it. This allows for a unique coloring, and could certainly have produce many interesting visual effects. Perhaps in another life, this type of display could serve as a sound level meter, with the LEDs pulsing on and off to the beat of the music. This entry was posted in Arduino and tagged Arduino Pro Micro, ATmega32U4, Makers, Nixie tube, Nixie Tube Thermometer on February 26, 2016 by Jeremy S Cook. This Maker decided to build his own MPPT (maximum point of power tracking) charge controller. Lukas was asked by a friend for help on a solar project. Inspired by an Instructables article, this friend wanted to make (or inspire someone else to make) a system to charge a battery to provide power in his garden. Charging a battery might seem like a simple task, but the a panel’s varying voltage output levels present a challenge. If this voltage spikes at too high of a level, there is a risk of damaging the battery. If this over-voltage condition were constant, a DC-DC converter, commonly known as a “buck converter” would be well-suited to make the needed voltage conversion. However, since it’s not constant, a “switching converter” would have to be used. Normally a switching converter cycles much faster than an Arduino would be able to handle, but since voltage levels change relatively slowly in this instance, an Arduino’s speed would be quite sufficient. Since this slower speed minimizes switching losses, it would actually be an advantage. The project is well-documented here, including available design files. Once this neat converter was built, the second step was to test it out. Lukas reports that it does its job with an efficiency of over 95% in the voltage range of interest. He plans to talk about the software involved next, so hopefully we will get to see the entire charging station come together soon! This entry was posted in Arduino and tagged Arduino, Arduino MPPT Solar Charger Shield, Makers, MPPT Charge Controller on February 12, 2016 by Jeremy S Cook. This 4x4x4 cube measures only 2cm on each side. If you read Atmel’s blog, chances are that you’ve seen a programmable LED cube. Given the amount of soldering involved, adequate space between each light would seem like a necessity. Hari Wiguna, however, decided that he could make a 4x4x4 cube measuring only 2cm on each side. In other words, as seen in the first video below, it would roughly fit on a quarter. This build took Wiguna “months to build, but it’s finally done,” and, unless he hears differently, it is the smallest 4x4x4 LED cube in existence. Soldering, as shown in the second video, seems that it was quite a nightmare, but at least he had a custom PCB on which to set his LED stacks once they were assembled. For work that small, he needed a fine-tip soldering iron, but had to actually build his own set of jigs to assemble everything correctly. The circuit, seen in the third video uses an Arduino Nano (ATmega328) to control the 64 RGB LEDs used. It’s a very clever setup, modeled after the Charliecube design found here. The four stacked LEDs are each rotated 90 degrees to each other, allowing its diode property to separate out each light’s signal. The resulting animations are quite impressive — amazing for something this size! Check out the three clips below for even more background on this tiny wonder. This entry was posted in Cool Things and tagged Arduino nano, ATmega328, Hackaday.io, LED Cube, Makers, Tiniest RGB LED Cube on February 11, 2016 by Jeremy S Cook. 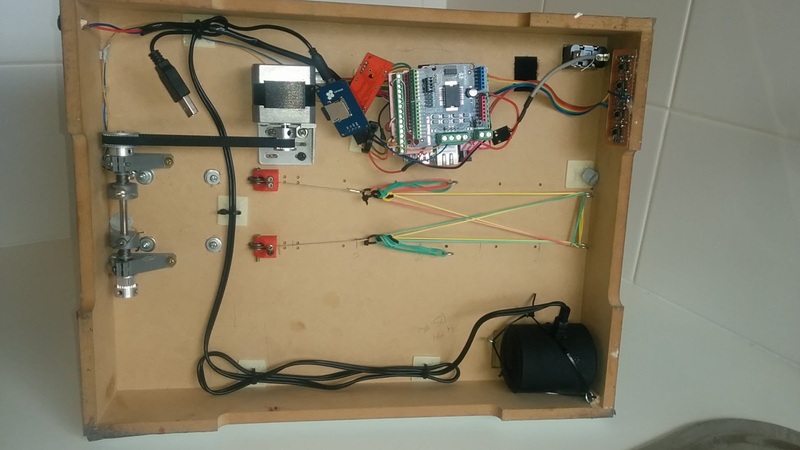 Maker Pierre Charlier shows how he was able to add NFC control to his car door with a KeyDuino. In the year 2016, the idea of having to use an actual key to lock and unlock your car is as obsolete as listening to a cassette tape. Pretty much every vehicle these days comes with a remote, which lets you wirelessly control your doors from afar. Not to mention, some whips can even sense when you’re in close proximity and automatically unlock as you approach. As you can see in the video below, the system also works with a smartphone for those who rather not wear a ring. Charlier has shared all of the code and a step-by-step breakdown of the project for those interested in adding NFC-enabled entry to your set of wheels. Looking ahead, the Maker hopes to have an improved prototype with a BLE+NFC board right on the door handle. The brainchild of Charlier himself, KeyDuino is Arduino-like board with built-in NFC capabilities that was successfully launched on Kickstarter late last year. Based on the ATmega32U4, the KeyDuino shares pretty much the same form factor and DNA as the Leonardo, and is compatible with most shields. This entry was posted in Arduino-Compatible and tagged HackADay, KeyDuino, Makers, NFC, NFC Car Door on February 9, 2016 by The Atmel Team. Maker Russell Munro created an Optimus Prime cake that actually transforms. While Jeff Highsmith may have been the unofficial Maker dad of the year in 2014 with his impressive mission control desk, it looks like we just found 2015’s undisputed champion. 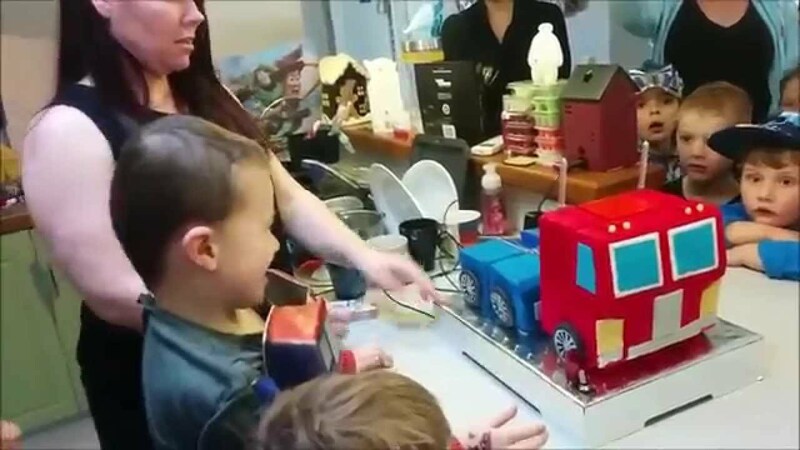 That’s because Russell Munro recently created the ultimate birthday cake for his six-year-old son: a talking Optimus Prime cake that actually transforms. According to Munro, the animated cake consists of a 3D-printed skeleton: a chest, thighs, arms and lower legs. The thighs and the chest are the only animatronic pieces, as the lower legs remain in place to support all of the movement. Metal fishing wire is wound up by a stepper motor which pulls the chassis to a standing position. A pair of arms pop out from the chest once the robot is fully upright. The entire operation is controlled by an Arduino, along with an EasyDriver from SparkFun, a 2A DC motor driver and an MP3 player module. The platform for the cake is made from 8mm MDF. With the help of his wife, the chocolate mud cake was then baked around the mechanism and ultimately topped off with an amazing icing job. Safe to say, this Maker will probably be receiving countless invites to birthday parties in the very near future. Intrigued? Read all about the build on his log, as well as his latest writeup in MAKE: Magazine. This entry was posted in 3D Printing, Arduino, Maker Movement and tagged 3D Printing, Arduino, Makers, Transformers Cake on February 9, 2016 by The Atmel Team. Just in time for winter, this Maker added smart temperature control to his infrared heater. The IoT refers to the idea that things, in this case an infrared heater, can be connected to the Internet. Although at times this may seem like overkill, in this case, it seems like a very practical solution. As creator Yuvaltz puts it, “Both IR heaters I have at home have only two power levels. Without any control, it’s easy to get to either a too hot or a not hot enough situation.” Naturally the Arduino-compatible and Wi-Fi-enabled Cactus Micro (ATmega32U4) was used to take his heater into the 21st century! The Cactus module controls a relay, which turns the heater on when appropriate. The control scheme is based on something called a proportional-integral-derivitave (PID) loop, which allows for several factors to be taken into account when deciding on the appropriate heater state. Since the Cactus is Wi-Fi-enabled, temperature variation as well as power output can be uploaded to a website. Yuvaltz setup a ThingSpeak channel for this device, and was able to generate two very interesting plots. One comparing the temperature data gleaned from two sensors that he tried, while the other plotted the temperature as well as how much power the heater put out at a certain time. As Yuvaltz notes, don’t try something like this unless you’re familiar with high-voltage safety. A simple remote control is suggested as an alternative, but perhaps even that could be hacked for PID control! Check out his entire build here. This entry was posted in Arduino-Compatible, Don’t Try This At Home and tagged ATmega32U4, Cactus Micro, DIY Smart Heater, IR Heater, Makers, Smart Heater on February 5, 2016 by Jeremy S Cook. Instead of shelling out hundreds of dollars, a 16-year-old decided to build his own professional-looking machine. If you don’t have a laser cutter, and would like one (after all, who wouldn’t?) you could buy one for thousands of dollars…. or build one yourself. 16-year-old “MichielD99” decided to do just that, and documented the entire process on Instructables. Control is handled by an Arduino Uno (ATmega328) running the grbl CNC controller software. This, in turn, runs two stepper motors via driver boards, as well as a laser via its own separate driver. It’s noted that this configuration could even be used as a CNC router if a rotary tool and Z-axis was added. What really sets this project apart is the beautifully-made physical structure. It’s constructed primarily from 18mm and 12mm sheets of MDF, which translates to roughly ¾” and ½” thick material. It’s been 3D-modeled, and the cutouts are available as PDF images and STL files. This means that if you want to replicate it, all you have to do is print the PDFs out, then use a bandsaw to cut out the appropriate pieces. STL makes it possible to replicate with a laser or CNC router. Some work with a Dremel tool will also be needed, though this could possibly be avoided if using a CNC router to make the cuts. If you’re going to create one of these yourself, this engraver is a great place to start (right after you purchase a pair of safety goggles meant for your laser’s wavelength). For another take on this type of tool, check out this build using similar electronics with a frame made of aluminum extrusion. This entry was posted in Arduino, The Workbench, Uncategorized and tagged Arduino Uno, ATmega328, DIY Laser Engraver, GRBL, Makers on February 1, 2016 by Jeremy S Cook.